Still in the Midwest/Southwest, my dad and I took in a game at the World Cup of Softball VII event in Oklahoma City's ASA Hall of Fame Stadium yesterday. Good times! 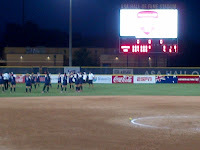 Though the 90 degree noon game (Canada vs. Puerto Rico) had just a few hundred shade-seeking fans, when I returned to the evening USA vs. Australia match the stands were packed, good for the female sport and supporters working hard since 2008 to bring softball back into the Olympics. Softball/baseball is up against wrestling and squash to get on the Olympic roster for the 2020 Games. Driving to the stadium, my dad and I talked briefly about our take on which sport is worthy of five-ringed status. For this blogger, softball is a great sport, but wrestling never should have come out of the Olympic roster in the first place (as it is an ancient sport of strength while the ball and stick games are more of a modern thing). But I do also think softball is worthy of the upgrade -- it was cool to see Team USA players around town in Athens in 2004. Sadly, the powers that be at the ASA may have shot themselves in the foot, according to a Daily Oklahoman sports column describing the runaround, sans bases, for the woman who is arguably the sports greatest player this year. Seems like a risky tactic for the Team USA decision makers to take on the eve of the IOC's vote for one sport to gain or regain Olympic status.